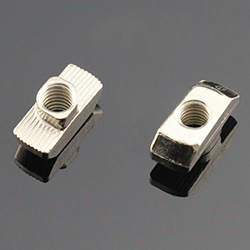 These are Drop in M3 T nuts which are compatible with 30 x 30mm T slot aluminum extrusion. These are drop in T nuts. They can be used while doing assembly or can be dropped in to the slot any time after completion of assembly (best suited for this).